Review: This film is set around 1750’s during the French and Indian War. There are three hunters who have got a British Colonel’s daughters who they are trying to save from harm. Another great film. One to definitely watch! Everything about it is brilliant. In 1993 the film won an Oscar for the Best Sound. It also won a Bafta for Best Cinematography and Best Make-Up Artist. 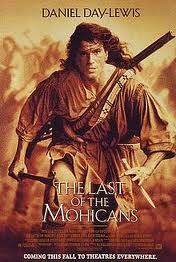 Based on a Novel by James Fenimore Cooper. Not suitable for kids as it contains strong violence. For Daniel Day-Lewis to prepare for this role he lived in the wilderness, went hunting and fishing and did this for several months.